"When was the last time you asked why you CAN have what you want? Instead, many of us ONLY see the obstacles in our way. And when we do, we can't see our way through. But what if those very same obstacles that stand in your way can actually be used to get you closer to your goals? This is the very question that LEVERAGE explores, and drawing on the latest research in positive psychology, post-traumatic growth, behavioral economics, and evolutionary psychology, LEVERAGE will show you that obstacles may be exactly what you need to get what you want. Offering a powerful new approach to improving happiness, Leverage reveals that the real secret to profound growth lies in the struggle through, not the victory over, adversity. We are taught that the quicker we bounce back from failure or suffering, the better off we will be. But what if, in fact, the opposite is true? 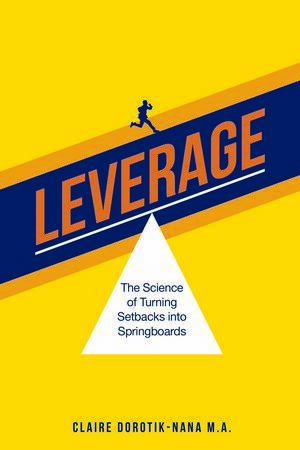 Presenting a radically different approach to healing and wholeness, Leverage reveals how the act of struggling with adversity produces growth—and how shortening this process may diminish your development rather than further it. By opening yourself to the possibility of both positive and negative outcomes, you leave room for unexpected, transformative opportunities. When you engage in the journey instead of blindly racing toward victory, you learn how to find joy and appreciation for life regardless of your circumstances, form deep and meaningful relationships, discover your strengths, and deepen your faith. Leverage invites you to take a deep breath and embark on an arduous adventure that will give you back your life."